JERON Teng had 22 points and got help from a host of players as De La Salle extend its winning run to five with an 83-70 win over University of Santo Tomas on Sunday in the UAAP Season 77 men’s basketball tournament at the Mall of Asia Arena. Jason Perkins, Prince Rivero, and Julian Sargent combined for 22 of their 37 points in the second half to help the Green Archers make the decisive breakaway on the way to their fifth win after a 0-2 start to the season. La Salle won the rematch of last year's finals despite injuries suffered by Norbert Torres and Kib Montalbo in the game. But the Archers drew balanced scoring that saw the starters contribute 48 and the second stringers 35. “Big minutes from those coming off the bench not just offensively but defensively,” said De La Salle coach Juno Sauler. “When Norbert got injured, we had to ask Yutien (Andrada) to come in. Julian played an all-around game, had to defend (Kevin) Ferrer. Robert (Bolick) was there to defend to give Almond (Vostoros) minutes on the bench. “The second group gave a good account of themselves,” added Sauler. Torres sustained a cut in his right finger in the second quarter while Montalbo pulled a muscle in his left leg in the third quarter. Perkins had 15 points while Rivero added 12 for the Green Archers. Sargent had nine of his 10 points in the final period. The Green Archers ended the third period with nine straight points capped by a Bolick three-pointer for a 59-51 lead. In the fourth, Sargent and Perkins converted baskets that put UST ahead, 72-62, with three minutes remaining in the fourth. UST suffered its second straight loss, falling to 3-3 overall. 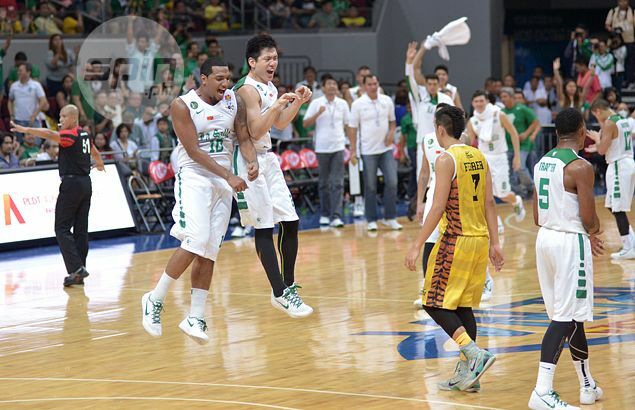 DLSU (83) – Teng 22, Perkins 15, Rivero 12, Sargent 10, Vosotros 9, Bolick 5, Andrada 4, Tratter 4, N. Torres 2, Montalbo 0. UST (70) – Mariano 20, Vigil 19, Ferrer 11, Abdul 10, Pe 6, Sheriff 4, Daquioag 0, Dela Cruz 0, Lao 0, Lo 0. Macasaet 0, Subido 0. Quarterscores: 17-15; 35-35; 59-51; 83-70.